Embellishments: Collections chipboard flowers, frames, butterfly & leaves, Flowers from Green Tara and Bazzill, miscl bling brads & stickers, Organza ribbon, Lace and metal buckle. Provocraft rubons. I attached the papers to the tin using double sided tape. The lace, chipboard and flowers were attached with glue dots. 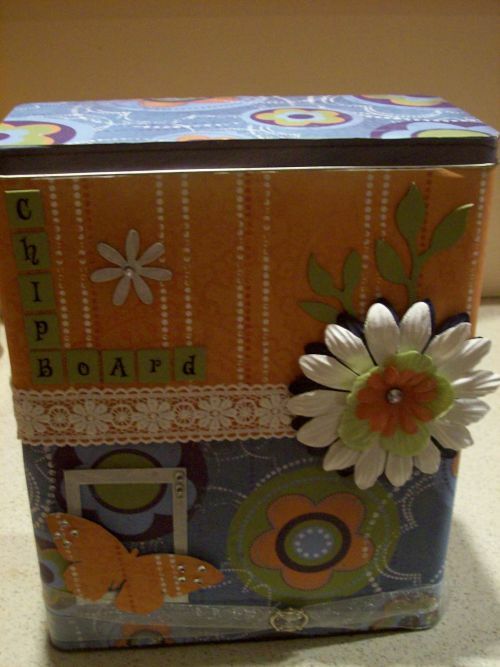 The chipboard butterfly was covered with paper. Chipboard frame and flower were coloured silver with a Krylon Pen. The chipboard tiles and leaves were painted with making memories paint. The organza ribbon was threaded thru the buckle twice and attached by glue dots.